Posted on Friday, August 24th, 2018 at 8:46 pm. Cannondale dropped a new line of aluminum-framed bikes for the gravel/adventure crowd today. While the bikes, named Topstone, look great as one would expect from the storied Connecticut firm, the biggest selling point of the new lineup is perhaps its budget-friendly price. With three models to choose from starting at $1,000 with Shimano Sora to the top of the line, $2,000 iteration with Sram Apex 1 hydraulic disc brakes and a dropper post, expect these to fly off the shelves… Oh and they’re available now. Posted on Tuesday, November 28th, 2017 at 10:40 am. 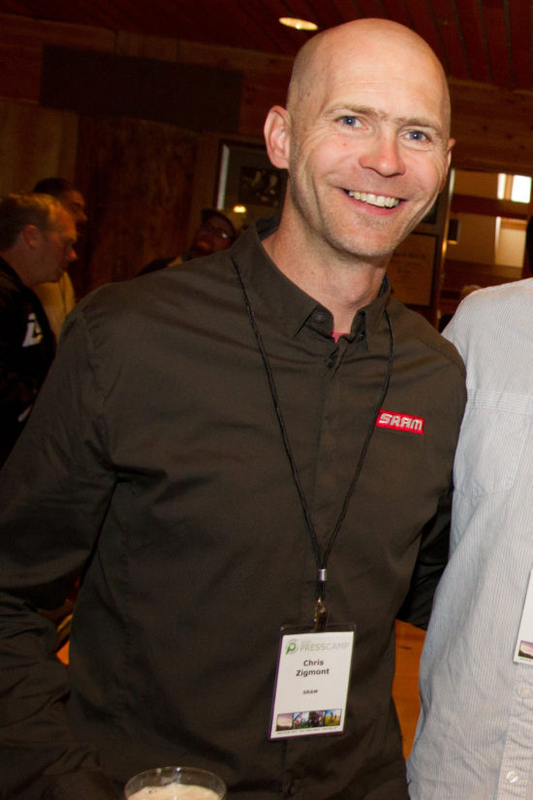 I met Chris Zigmont a few years ago when he was running, the now defunct, Bicycle PressCamp (R.I.P.). I think it can be said that Zigmont is a bicycle geeks bicycle geek, so when I saw he was racing Grinduro I was curious to see what sort of rig he had brought to conquer the mountain. And I was not disappointed, but I’ll let him tell you all about it. If you don’t know Chris, you are in for a treat. Enjoy. Can you tell me where you grew up: I’m a Connecticut Yankee. Born in Newtown CT, actually went to Sandy Hook Elementary (yes, that Sandy Hook) with my Brother and cousin Gerald. My Aunt taught there too. We moved to Avon in the Hartford area when I was a boy and finished growing up there. Tell me your first recollection of riding a bicycle: My earliest memory was riding my older brother’s black Savoy at our house on Lyrical Lane in Newtown. Riding my brother’s bikes would become a theme and the spark for my cycling life. How did you end up in the bicycle business: Strange path. We were always making Franken-bikes, rebuilding, swapping stuff. We were, we thought, getting pretty competent on bike repair. We weren’t well off, so shade-tree wrenching was a requirement After borrowing and wrecking my brother’s 1973 Fleetwing (with Campagnolo Valentino! ), I needed to fix it. But it was this bike that drove my passion for riding. A few years later, I opened a neighborhood repair shop in a friend’s basement. Eventually, I rented a small business space down the road. I was 18. I failed and closed, but I learned a lot. From there I went to work at the region’s largest retailer, and I began managing one of his stores by 20. My leap to the manufacturer’s side came in 1985 when, chasing a girlfriend to California, I called Specialized Bicycle Components nearly every day for more than a month until they gave me a job in sales! The Stumpjumper was a new thing, Shimano Index shifting hadn’t launched yet. It was early days in MTB and a lot of fun. Where are you living now and what does your current job entail: I am now in Chicago with my family, and I serve as the Global Road Brand Director for SRAM. In that role I manage the global marketing communication strategy for our road brand’s SRAM, Zipp, and Quarq. So that means everything from overseeing sports marketing, advertising, PR, social media and content, product launches, etc. Do you believe there is such a thing as a one-quiver bicycle: There are amazing things happening right now with drop bar bikes. I’ve got three unique bikes in my garage that I feel I could successfully contest either a road race, a gravel race, or a CX race on; a 3T Exploro “aero Gravel” bike, a Canyon Ultimate road bike, and a Santa Cruz CX bike. They each offer a unique ride and approach to each of those ride/race opportunities and a little bit of compromise as well. Yet, paradoxically, bikes are also becoming more to the discipline. But I do believe rider’s can put one rig in the garage that would deliver smiles on a very broad spectrum of terrain and ride types. I know you race cyclocross, what do you think of the new gravel bike racing trend: Love it. I’ve been doing more and more gravel and less and less road. But I do hope it stays focused on the rider’s experience. I believe its something to “do” not something to “see.” I’m generally not looking to sponsor gravel racers. But I do want to work with event promoters who are really focussed on the day’s experience. Can you tell us about your Grinduro build and what you think you might do differently, if anything: Ha! You bet. The first thing I would do differently is ride it before arriving! But, seriously, not much different. We built out a 3T Exploro in a 650b configuration with Zipp’s new 303 tubeless ready 650b wheels. I ran SRAM Force 1, with a 42t ring and a 10-42 cassette in the back. Zipp SL Speed stem and their new carbon SL-70 Ergo bar. It was quite perfect and good enough for 8th place in the old man’s category. I ran WTB Byway tubeless tires, 650×47. Not much tread, so I was nervous. But it was actually quite good. I only ran about 27-28 psi, so the float and grip was ideal. If you had to guess, what trends do you think we will see in the future: From where I sit, we see lots of interesting advances in cycling. Other than l’Eroica, I don’t know if we will be seeing rim brakes for too much longer. We are seeing broad acceptance of disc brakes from Triathlon to the Tour de France. So look for more discs on more types of bikes at more price levels. Certainly the trend in “any road” bikes will continue its blossom. I think the root of this is the desire to get off the paved road with cars. Is gravel going to kill the road bike and mountain bike industry: Good question. We will see. I don’t think so though. Road is going though its own maturity as is MTB. Its changing and refining. Road participation at gran fondos is better than ever. Grassroots MTB, NICA and Regional Enduro are strong. I just see continued diversity. Ebikes will drive much of that as well. E-road bikes are coming in a big way and we’ll see couples and friends riding together that could before for example. You’ve had a chance to ride in some pretty amazing places, can you recommend a couple for us: I’ve been very lucky to ride in some cool places, usually shoehorned in around work. The Lost Sierra from Griduro should be explored by all. But additionally, I feel I keep finding “amazing” hidden among the pedestrian. Places that folks take for granted or don’t recognize the beauty in front of them. Some of the one that come quickly to mind are the Franconia region of Germany, near Würzburg. Endless ribbons of pavement and forested gravel, vineyards and farms. Really amazing. Another fun one is on big island of Hawaii, riding down to Captain Cook/ Kealakekua Bay, where said Captain made his final miscalculation of the locals. The ride is stunning, with a wicked descent on the south side, and if you plan right with a pair of trunks and swim goggles, you can swim among the most beautiful fish and some dolphins. Finally, for me, I guess I’m missing New Hampshire and the pastoral rides I’ve had there working your way Northwest from the Seacoast, there are so many hidden gravel and asphalt gems. There are many great places yet to ride but those three are top of mind. Tell us one thing most people probably don’t know about you: Hmmm, Id say most people don’t know that I am a cancer survivor. I’ve twice battled Lymphoma. So far I am winning. Cancer changed my life. I absolutely work to drink in life every single day. I work to live it as much as, and as hard as, I can. I’m only now working to learn on the savoring. Making the moments more valuable and felt. Top: The morning’s opening climb at Griduro. Photo/Colin Meagher Middle: Sitting 3rd wheel in the high-powered Ted King Train on Stage 3. Photo/Colin Meagher. Bottom: Chris Zigmont at Bicycle PressCamp. Photo: Billy Michels.